Chicago, IL – Over 200 home movies, spanning more than half a century of South Side visual history, will be available to view online beginning May 1, 2018. The new South Side Home Movie Project Digital Archive is a globally accessible online portal to home movies shot by residents of Chicago’s South Side neighborhoods from 1929-1982. This contemporary platform provides access to the entire collection of digitized home movies archived by the South Side Home Movie Project (SSHMP). Designed to encourage a wide range of visitors to browse, explore, and discover, the SSHMP Digital Archive showcases home movies organized into easily navigable categories: by the family that contributed their films; by subject matter, ranging across topics like fashion and birthdays to graduations, road trips, and the Bud Billiken Parade; year of production; filming location, including local landmarks like Buckingham Fountain and national and international locations like the Lorraine Motel in Memphis and early US tourist stops in China; or even specific camera techniques employed by the filmmakers such as close-ups, filming from cars, and aerial shots. Oral histories recorded by family members describing their home movies are also available as companion works to the films. The SSHMP Digital Archive also allows visitors to add tags and comments to help with identifying places, people, and events in the footage as participants in a collective historical project. SSHMP has developed a uniquely successful model for encouraging local residents to recognize the value of their personal archives, to preserve the original film prints in optimal conditions, and to digitize the home movies for public access, scholarly research and creative projects. SSHMP is actively seeking participants to contribute their films and their stories to the archive. Online access to the Digital Archive is free, and viewers can browse, stream, and comment on the videos on any device. The films are particularly evocative of an era: as most of the 8mm and Super-8mm film of the period did not record sound, the films in the archive are largely silent. Film clips may be downloaded for research and creative projects with written permission from SSHMP. "We are frequently approached by documentary filmmakers who have difficulty finding footage of family life in Chicago, particularly among African Americans, during this time period," says Stewart. "Also, having worked with local musicians who find inspiration in the poetic silence of these films, and high school students who use SSHMP films to reflect on pressing issues of gentrification and activism, we welcome inquiries regarding creative projects as well as research projects." From birthday parties to family holidays, picnics and parades, home movies show precious details of everyday life in our communities. Unfortunately, these fragile films are in danger of fading and disintegrating if they are not preserved. 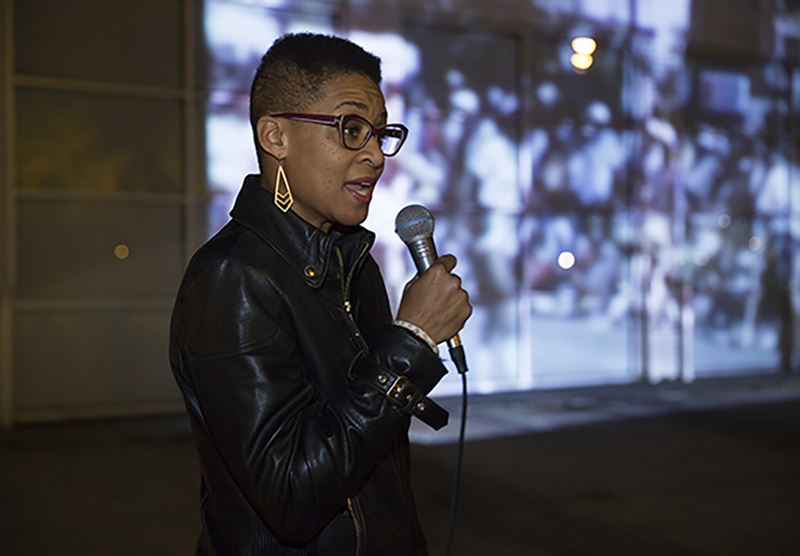 Through this new digital archive, and an active program of screenings and exhibitions across the South Side, SSHMP works to ensure that the diverse experiences and perspectives of South Siders will be available to students, teachers, researchers, artists and filmmakers today and in future generations. (1) Film still from the Ellis McClelland Collection, courtesy of the South Side Home Movie Project. ; (2) SSHMP Archivist Candace Ming inspects home movies from the family collection of musician Oscar Brown Jr., courtesy of the South Side Home Movie Project. ; (3) SSHMP Director Jacqueline Stewart introduces an outdoor screening of home movies near Chicago’s Washington Park, courtesy of the South Side Home Movie Project. The South Side Home Movie Project (SSHMP) is a five-part initiative to collect, preserve, digitize, exhibit, and research home movies made by residents of Chicago’s South Side neighborhoods. The SSHMP seeks to increase understanding of the many histories and cultures comprising Chicago’s South Side, and of amateur filmmaking practices, by asking owners of home movies (shot on 8mm, Super8mm, 16mm film) to share their footage and describe it from their personal perspectives. The project brings materials that are typically kept in private collections into public light and discussion. We aim to build an alternative, accessible visual record, filling gaps in existing written and visual histories, and ensuring that the diverse experiences and perspectives of South Siders will be available to larger audiences and to future generations. Supported by the University of Chicago's Division of the Humanities, Center for the Study of Race, Politics, & Culture, the Film Studies Center, the Reva and David Logan Center for the Arts, Women's Board of the University of Chicago, and the Office of Civic Engagement's Community Program Accelerator.